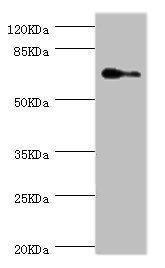 Small volumes of anti-ELF1 antibody vial(s) may occasionally become entrapped in the seal of the product vial during shipment and storage. If necessary, briefly centrifuge the vial on a tabletop centrifuge to dislodge any liquid in the container`s cap. Certain products may require to ship with dry ice and additional dry ice fee may apply. Transcription factor that activates the LYN and BLK promoters. Appears to be required for the T-cell-receptor-mediated trans activation of HIV-2 gene expression. Binds specifically to two purine-rich motifs in the HIV-2 enhancer. NCBI/Uniprot data below describe general gene information for ELF1. It may not necessarily be applicable to this product. 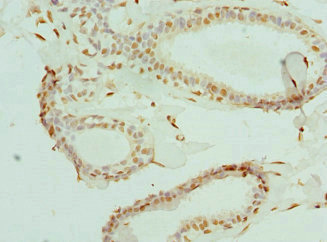 Elf-1: Transcription factor that activates the LYN and BLK promoters. Appears to be required for the T-cell-receptor-mediated trans activation of HIV-2 gene expression. Binds specifically to two purine-rich motifs in the HIV-2 enhancer. Belongs to the ETS family. 1. 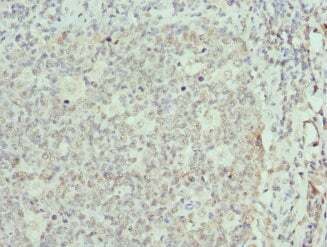 Data suggest that Elf-1 may modulate breast cancer progression to some extent without having an impact on survival of breast cancer patients.